​ Sealaska Heritage Institute (SHI) will sponsor a viewing of its exhibit on Alaska Native masks and roundtable discussions with the prominent artists whose work is featured in the display in a day-long, free event that is open to the public. 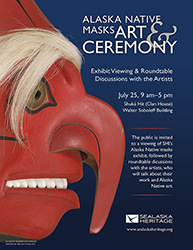 The event will kick off with a guided tour of the exhibit, Alaska Native Masks: Art & Ceremony, which includes 50 masks from the Iñupiat, Yup’ik, Alutiiq, Athabascan, Tlingit, Haida and Tsimshian. The exhibit formally opened in 2017 and is on display in the Nathan Jackson Gallery at the Walter Soboleff Building in Juneau. The event will then move to the clan house in the building for roundtable discussions with master artists from Alaska, Washington State and Canada, including Earl Atchak—a well-known traditional Cup’ik artist; internationally acclaimed Northwest Coast artists David A. Boxley and Robert Davidson; Perry Eaton, whose Alutiiq masks are exhibited nationally and internationally; nationally known Iñupiaq sculptor Larry Ahvakana and a number of other prominent Native artists. The roundtables will conclude with a group discussion. The artists will address a number of topics, including the differences, if any, between how they view art made for the market versus pieces used in ceremony, said SHI President Rosita Worl. “They will also discuss the major issues facing artists today and possible solutions. We’ll seek their advice on SHI’s expanding art programs and priorities and on our developing partnership with the University of Alaska Southeast and the Institute of American Indian Arts in our effort to build more opportunities for Native artists,” said Worl, adding the event is part of SHI’s effort to promote cross-cultural understanding. The event is scheduled 9 am-5 pm, Tuesday, July 25, at SHI’s Walter Soboleff Building. Following the tour of the exhibit, SHI staff will provide an overview of SHI’s art programs and initiatives. The first panel will convene from 10 am-12 pm, followed by a second panel from 1 pm-3 pm and a group discussion from 3:30 pm-5 pm.